This award-winning, critically acclaimed, raw, in-your-face comedy epitomizes the roll-up-your-sleeves, never-say-die, do-it-yourself Detroit spirit and promises to be the most fun you will have at the movies all year. Hoping to help reverse the negative stereotype that Detroit has garnered in movies over the past three decades and against all odds, director Robert Phelps set out on a seven-year journey, sacrificing everything to make the film that would show the world the Detroit he knows and loves, the one that is a great place to live and work, the one full of family, friends and most importantly, laughter. “I am very proud of my city. It is a beautiful city full of amazing people. I’m sick of how it’s portrayed in movies, so I wanted to make a film that the people of Detroit can identify with, relate to and be proud of. Most importantly, I wanted to make a movie in which Detroiters can forget about their problems and just laugh for 90 minutes straight,” said Phelps. “Stick It In Detroit” opens in theaters beginning Friday, November 6th, only at MJR Theaters: Waterford Cinema 16, Marketplace Sterling Heights Cinema 20 and Southgate Cinema 20. 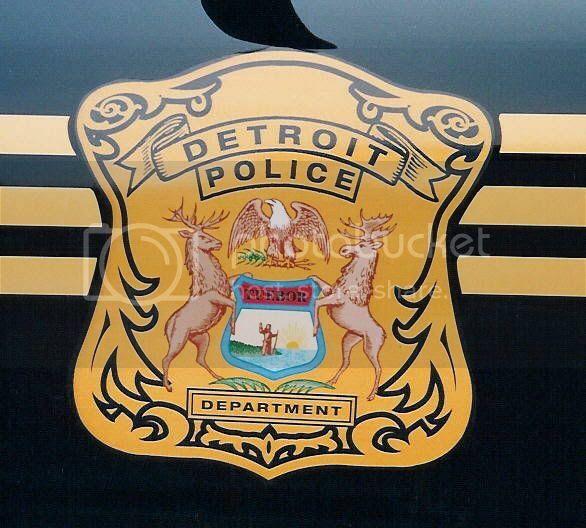 Forbes has released its annual "America's Safest Cities" list and Detroit ranks 12 in the nation! Mind you, just a year and a half ago, Forbes listed Detroit as the most dangerous city in the U.S. Oh, how times have changed! The cities were ranked based on the lowest rate of violent crimes, workplace deaths, fatal crashes, and natural disasters. The Kresge Eminent Artist Award recognizes an exceptional artist in the visual, performing, or literary arts for his or her professional achievements and contributions to the cultural community, and encourages that individual’s pursuit of a chosen art form as well as an ongoing commitment to Metropolitan Detroit. The award is unrestricted and is given annually to one artist who has lived and worked in Wayne, Oakland, or Macomb Counties for a significant number of years. The first-ever Kresge Eminent Artist Award was presented last year to Detroit visual artist Charles McGee. The Eminent Artist Award is administered by the College for Creative Studies. The award recipient is selected by an independent review panel composed of prominent artists and arts professionals from the Detroit area. Belgrave himself attributes the award to his lifelong devotion to education in the community. “They knew that if they gave the money to me that I’m going to keep on doing what I been doing.” Indeed, Belgrave has been dedicated to teaching jazz to young people, both informally and formally, since around 1970. In addition to his work as an educator in the Detroit music community, Belgrave also teaches jazz at Oberlin College, along with Wendell Logan, Gary Bartz, Robin Eubanks and Dan Wall. He enjoys teaching to these college kids who likely are very different from the inner city kids Belgrave has mentored over the years. “They seem to like my approach there.” He laments that he doesn’t get to spend more time with his fellow professors, who tend to come to the campus for different 2-3 days stretches. And Belgrave continues to be active as a performing musician. He recently toured with his wife, singer Joan Belgrave, in a show dedicated to Louis Armstrong. He performs and records regularly in the Detroit area and is a founding member of the Detroit Jazz Musicians Co-Op. Recently, Belgrave represented Detroit as part of the Lincoln Center Motor City Jazz Masters tribute which Included Yusef Lateef, Curtis Fuller, Charles McPherson, and Ron Carter. A photographer and an architect plan to freeze one of Detroit's thousands of abandoned homes this winter, encasing it in ice to draw attention to foreclosures that have battered the region. "I've been really fascinated by the whole mythology of Detroit and the structures and what they represent," said Holm, who grew up on the city's east side and lived in the suburb of Hamtramck from 1997 until moving to New York City four years ago. Holm and Radune are working to raise $11,000 online to fund the project, mostly for costs related to demolition, and hope to soon figure out where in the city they'll freeze a home. It's Detroit's distinctive history that makes it so resonant for this kind of work," said John Beardsley, an adjunct professor with Harvard's Graduate School of Design. "It was a go-go city that in recent years has been identified as gone. A year ago, Charles opened Le Petit Zinc with the simple belief that there was a market here for a crêperie and cafe that served fresh organic food at a decent price. But that was certainly no guarantee of success. Not only was the economy cratering, but the building itself, an abandoned day care center tucked between a working-class Irish neighborhood called Corktown and a few abandoned warehouses, was on a street with no foot traffic. The only thing the place had going for it was a rundown playground out back that was good for outdoor seating. For the first five weeks after opening, when he was the cook, waiter, busboy and janitor, he had no idea what to expect. Now, we are all raised to think of business as a sort of vicious spy-versus-spy, cutthroat activity where every competing establishment is out to stick a shiv into the other. You’d think that this kind of blood thirst would be even worse in Detroit, which — with Jimmy Hoffa’s disappearance, Eminem’s lyrics and our old, quaint Devil’s Night tradition of burning down houses — has acquired a certain reputation for toughness. But Charles discovered that the neighboring Detroit restaurants actually had quite a different reaction to a new competitor. The owner of Slows, a barbecue place nearby, not only helped him get his permits, but also built tabletops for him at no cost. Jordi, the owner of the Cafe con Leche coffee shop, hooked him up with his coffee supplier. Dave, who had recently opened Supino Pizza, even dropped everything one day to get the paper Charles needed for his credit card machine. Most surprisingly, just as Charles was starting up, Torya Blanchard was opening another downtown crêpe place called Good Girls Go to Paris. Instead of treating Charles like a rival, Torya happily exchanged recipes with him, even coming in one day to help make his batter, an act of crêperie solidarity that would surely have made Detroit’s founder, Antoine de Lamothe Cadillac, extremely proud. “They want their neighbor to make it,” he says. “It’s different from anywhere I’ve been. Here, your success is their success.” Even his suppliers have shown a generosity he finds surprising: the Avalon bakery charges him wholesale prices even if he orders just one loaf. In other ways, too, Charles seems to have timed things well, opening just when Detroit residents with an agricultural bent were beginning to take advantage of the 40 square miles of unoccupied open land here, an area almost the size of San Francisco. Greg Willerer, for instance, sells Charles spinach, flowers and zucchini at an affordable price, all grown within the city limits. Charles also planted his own garden out by the patio, putting in tomatoes, basil, peppers, thyme, parsley and beets. Maybe it’s that adage that nothing brings a community closer than having a common enemy. For the restaurateurs, the residents, the urban farmers and the community activists now working to reshape the city, the enemy is Detroit’s own reputation. They know they will succeed only if they are a part of a larger, collective success, one that makes downtown a thriving destination again, and so they’re working together to make it happen. Sure enough, people are now driving in regularly from affluent suburbs like Bloomfield Hills and Grosse Pointe to try his smoked-salmon crêpes and ratatouille, a considerable achievement considering many suburbanites come downtown only for Tigers games or a night at the symphony. While I was there, the place was bustling with a diverse crowd that seemed more than satisfied. “This is the best restaurant ever. 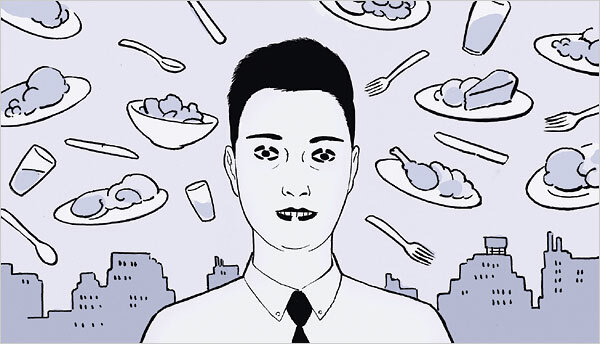 I would eat here all the time if I had more money,” beamed a woman dining alone at the bar. “Somebody send that lady a dessert!” shouted Charles with a smile. 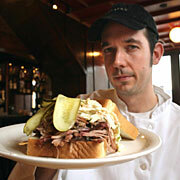 Now This is Something to Get Excited About: Slows Bar BQ is Expanding in Detroit! According to the Louis Aguilar Detroit News, Slows Bar BQ will be opening its second location, Slows to Go, a takeout and catering business in the Midtown area (NW corner of Cass Avenue and Alexandrine Street) by the middle of 2010. The 6,000-square-foot building expands the reach and capacity of the Michigan Avenue restaurant, which was an instant success when it opened four years ago, west of the old Tiger Stadium. The new building will allow for the preparation of larger quantities of food compared to the original restaurant, which has a tiny kitchen and limited smoker capacity. It also will fill carryout and catering orders. "We're just trying to keep up with demand," said chef Brian Perrone, who also is an owner. With its slow-food, Southern-inspired menu, Slows has been named one the best barbecue restaurants in the nation by Bon Appetit magazine, the Wall Street Journal and others. Slows to Go is a $1.5 million investment, including the purchase of the building. The original restaurant's success tapped into a number of movements, including the counter-trend of young people moving back into the core city and the interest in restoring old Detroit buildings. "We view differently than Time (magazine) and other reports," said co-owner Phil Cooley, referring to a spate of national coverage of hard times in Detroit. Phil Cooley, a 31-year-old former Louis Vuitton model, convinced his brother Ryan, a former Chicago banker, and their parents Ron and Patty to move to Detroit. And all of them are owners. Other owners include general manager Terry Perrone and sous chef Mike Metevia. "I've lived in Milan, Barcelona, Tokyo, Paris and Chicago and this is best community that I know,"said Phil Cooley. "The people who are here are often very committed to the area." Save the Date for Detroit! Days of our Lives has partnered with NBC affiliate WDIV Local 4 and the MGM Grand Detroit to hold its first ever talent and fan search in Detroit, Michigan, on Friday, November 13 and Saturday, November 14, 2009. Fans and aspiring actors alike are encouraged to come take part in this historic occasion. The biggest Days fan will win a trip to Hollywood, California, with a visit to the Days of our Lives set. Promising actors will have the chance to win a role on the award-winning show. All of those participating in the search will have the opportunity to meet some of Salem's favorite cast members including Bryan Dattilo, James Reynolds, Nadia Bjorlin and Shawn Christian. Days is collaborating with Gleaners Community Food Bank for events through the week leading up to the main function on Friday. Gleaners is the third-oldest food bank in the United States and their mission is to turn surplus food, which otherwise would go to waste, into millions of meals for hungry people. Those involved from the show will not only get to discover new talent, but will also have a hands-on experience helping the Detroit community. All participants are encouraged to bring a can of food or non-perishable donation to the event on Friday, November 13. I have a simple request of you: join with me and help make a world of difference for Detroit. We are all tired of the media's bad habit of picking on our area. 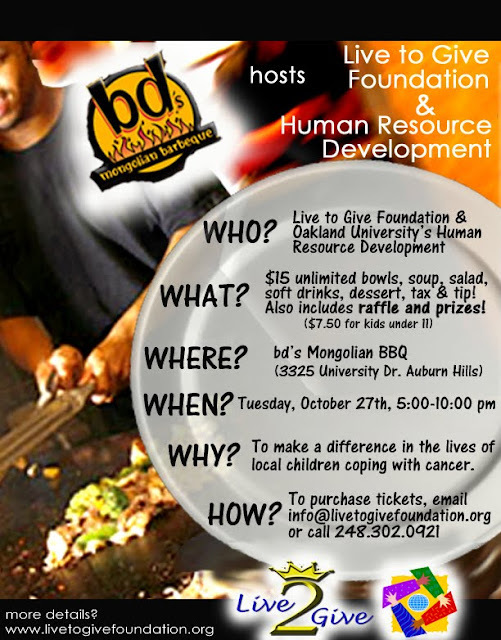 I ask of you to help change the world's perception of the Detroit Area and one by one, we can do it! My goal is simple with Positive Cities Detroit: To create a fun, interactive online media platform that gives the voice back to the people to decide how we want the rest of the world to perceive what's really going on in our own backyard. We cannot expect the world to speak kindly of us if we don't do it ourselves. I was invited a few weeks ago by the website Kickstarter.com to raise money for Positive Cities Detroit, a Michigan Non-Profit. There are 1,262 Facebook Fans of Positive Detroit and 2,308 Followers on Twitter. If every fan pledges just $15 (that's just 5 days of Starbucks!) to my Kickstarter drive, I will achieve the monetary goal and the Positive Cities Detroit website will launch in early January of 2010. Oh, and did I mention you get some great prizes along with your pledges!!! If you think PositiveDetroit.net is great, just wait and see what I have in store for Positive Cities Detroit. It is like nothing you have ever seen before and I promise you will love it! Please help me make Positive Cities Detroit a reality, not just for me, but for all of you. Detroit's $22 million ferry and Great Lakes cruise-ship terminal will help revitalize the area economy and is another fruit of the federal economic stimulus program, U.S. Transportation Secretary Ray LaHood said Monday. LaHood, U.S. Sens. Carl Levin and Debbie Stabenow, Reps. John Dingell and Carolyn Cheeks Kilpatrick and Michigan Transportation Director Kirk Steudel toured the facility. It will be fully operating next summer. The passenger terminal and public dock on the Detroit River is getting $7.1 million in federal stimulus funds. The project wouldn't be moving ahead as is without congressional approval of President Barack Obama's economic recovery plan, said LaHood, who thanked the Democratic lawmakers flanking him at a riverfront news conference. "It's not an easy thing to vote for spending $700 billion, but it's working," he said. The project consists of a two-story headquarters on the Detroit River near the Renaissance Center and a 200-foot-by-25-foot offshore wharf serving cruise ships, ferries and water taxis connecting to nearby Windsor, Ontario, and other sites along the river. Plans have been on the drawing board for a decade, but officials didn't agree on a site until 2004. It's part of a series of Detroit riverfront developments that gained momentum in 2007 with the opening of the Tri-Centennial State Park and the opening of 2 1/2 miles of what is to be a 3 1/2-mile Detroit RiverWalk from downtown east to the Belle Isle park bridge. Michigan Transportation Director Kirk Steudel said the wharf and terminal will reinforce proposed light-rail and high-speed train service in spurring redevelopment of the region. Levin, a former Detroit City Council president, said the project marks the culmination of more than half a century of efforts to open Detroit's shoreline to the public. "What we're witnessing is the renewal of this riverfront," he said. Earlier Monday, LaHood met with Ford Motor Co. officials. He's taking part in a series of briefings Monday and Tuesday on U.S. safety technology programs at Ford, General Motors Co. and Chrysler Group LLC. "We got to ride the new Taurus," LaHood told Dingell. "Great car. They're back in the business, I'd say." On Tuesday, LaHood is scheduled to address the Detroit Economic Club to defend the stimulus plan. The Detroit Pistons and presenting sponsor National City teamed-up with Samaritan’s Feet to tip-off their 2009-10 season by donating 1,000 pairs of new shoes and socks to pre-identified children from the metro Detroit area on Tuesday, October 20, 2009 from 4-7 p.m. at Boll Family YMCA (1401 Broadway, Detroit, MI 48226). The entire Pistons team will be on-hand to help distribute the shoes during the event. Employees from National City, Fathead, Palace Sports & Entertainment and Pistons mascot Hooper will be volunteering during the event. This event is part of the NBA Cares “Week of Service” where every NBA team is giving a day of service to their local community. Fathead is also supporting National City and the Pistons to help provide the 1,000 pairs of shoes and socks. Parking accommodations were made possible by the Detroit Opera House. Samaritan’s Feet, founded in 2003, is a humanitarian relief organization based in Charlotte, NC that puts shoes on the feet of children all around the world. With over 300 million children going without shoes everyday, their goal is to provide 10 million pairs of shoes to 10 million impoverished people in 10 years. To date, nearly one million pairs of shoes have been collected for children around the world. President and Founder, Manny Ohonme, received his first pair of shoes at the age of 9 from a missionary. He started playing basketball and other sports with these new pair of shoes and earned a spot on a traveling basketball team and eventually his high school team. Upon graduating high school, he was offered a scholarship to play basketball at the University of North Dakota (Lake Region), where he received his Bachelor’s and Master’s Degrees. To learn more about their organization, www.samaritansfeet.org or contact Todd Melloh at 317-417-3525. Yelp.com, the site that connects people with great local businesses, presents Hawt on Yelp, a week-long promotion dedicated to giving consumers the chance to try great local spas at deeply discounted prices. The promotion will run from Monday, November 2nd to Sunday, November 8th. Hawt on Yelp will be running nationwide in 14 markets with 143 spas participating in the program. Other markets offering the promotion: Atlanta, Boston, Dallas, DC, Denver, Houston, Los Angeles, Miami, Minneapolis, Orange County, Philadelphia and Phoenix, San Diego. 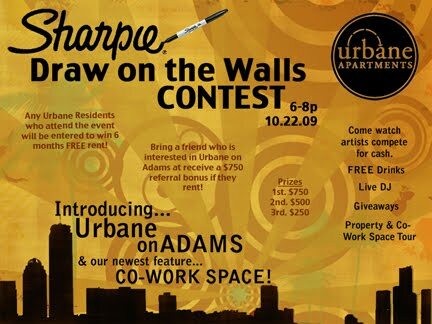 Urbane Apartments Celebrates The Grand Opening of Their Birmingham Location with a Sharpie Contest! Come take a sneak peek at the newest Urbane feature...CO-WORK SPACE @ Urbane on Adams! If you've seen the Urbane Offices, you know how snazzy we like it! If you live at Urbane, you get to use this space for FREE. We're also small-medium companies to lease out part of the space for everyday use! Urbane Residents attending the event will be entered to win 6 month FREE rent! Not an Urbane Resident yet? ?...Rent a TRENDY one bed @ Urbane on Adams during the event and you too will be entered in to win 6 months FREE rent! If you are an artist and want to get in on the friendly competition, shoot us an email or give us a call! Woodward Avenue Receives All-American Road Designation from U.S Dept. of Transportation! On Friday, October 16 historic Woodward Avenue was designated a All-American Road (AAR), the highest honor for a road in the United States, by the U.S Department of Transportation. This important designation is administered by the Federal Highway Administration's National Scenic Byway program. The AAR status will now include Woodward Avenue in the international tourism marketing campaigns done by the FHWA of the prestigious AAR program. The elite collection of 37 roads were selected because of their scenic, natural, historical, cultural, archaeological or recreational qualities that contributed to the America's story which could not be duplicated anywhere else in the country. The Woodward Avenue Action Association, a economic and community development non-profit submitted the application for the designation in January of this year with the full support of state and local goverment officials, community and business leaders. For more information on the designation please visit: http://byways.org/press/news/releases/2009/1942 . Earlier this week, Brammo's director of product development Brian Wismann along with Dave Schiff of Crispin Porter Bugosky, began a ten-day journey meant to take them to Washington, DC. The trip, which is being chronicled on the site shockingbarack.com, is intended to raise awareness of the company's new electric motorcycle, the Enertia, and electric vehicles in general. The trek began at Zingerman's deli in downtown Ann Arbor, MI, which just happens to be a a few blocks from this blogger's office. Brian and Dave swung by the office for a visit to show off the bike – which they prefer to call a powercycle – and chat about what it can do. Along the route to the capital, they'll be making plenty of similar stops, partly to demonstrate the bike but mostly out of necessity. While the Enertia is undoubtedly a neat ride, it underscores two of the major problems with EVs. They are expensive ($11,995 for the Enertia) and have limited range. This bike only has a 42-mile range and then takes four hours to charge. That means plenty of short hops to cover the 520 miles to DC. On the plus side, it should only take about $4 worth of juice to make the trip. Hopefully sales will bring volumes that help bring the cost down. In the meantime, check out the video after the jump. Governor Jennifer M. Granholm today announced that Detroit will host the 2010 World Stem Cell Summit organized by the Genetics Policy Institute. The conference will take place October 4-6, 2010, at the Detroit Marriott at the Renaissance Center. It will be co-hosted by Michigan State University, the University of Michigan, Wayne State University, and the Michigan Economic Development Corporation. The summit will attract more than 1,200 of the most influential stem cell stakeholders from more than 30 countries, representing the fields of science, business, policy, law, ethics and advocacy. There will be 150 internationally-renowned speakers, producing a unique international network designed to foster collaborations, economic development, technology transfer, commercialization, private investment and philanthropy. Presidents of all three universities expressed enthusiasm about the summit. Covered at the summit will be all areas of stem cell science, disease models, drug discovery, tissue engineering, bioreactors and nanotechnology. There will be progress reports on treatment for cancer, diabetes, spinal cord injury, multiple sclerosis, Parkinson’s disease, ALS, neurological disorders and cardiovascular disease. Panels will discuss commercialization, funding, economic development, regulatory agency perspectives, law and ethics. The summit also will feature the 2010 Stem Cell Action Awards Dinner where the Genetics Policy Institute will recognize organizations and individuals who have most positively impacted the stem cell community. At the 2009 summit dinner in Baltimore, two Michigan stem cell organizations won awards: Michigan Citizens for Stem Cell Research and Cures won the Education Award, while Cure Michigan won the Grassroots Advocacy Award. The 2010 World Stem Cell Summit will be the sixth annual conference organized by the Genetics Policy Institute. Previous summits have taken place in Houston, Palo Alto, Boston, Baltimore, and Madison, Wisconsin. City Manager Tom Markus was not surprised when a representative from CNNMoney.com informed him that Birmingham had made their Best Places for a Healthy Retirement list. “It’s a community that is safe, clean, healthy, and it has all the amenities, so I wasn’t surprised we were in there,” he said. One of just 20 communities nationwide to make the list, Birmingham was the only town in Michigan to be recognized. Cities made the list based on a variety of factors, such as population, the percentage of people over the age of 50, the number of doctors in the county, the number of hospitals within 30 miles, life expectancy at birth, and whether the city provides for an active lifestyle, according to the CNNMoney.com Web site. The top 10 list included Anaheim, Calif; North Hempstead, N.Y.; Fort Lee, N.J.; Yonkers, N.Y.; Downers Grove, Ill.; Los Angeles; San Jose, Calif.; Natick, Mass. ; Stamford, Conn.; and Seattle. CNNMoney.com noted that in Birmingham, the focus is on walking, although it’s just a half-hour’s drive from the hustle and bustle of downtown Detroit. 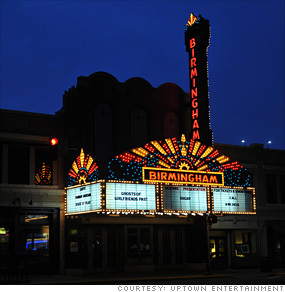 The Web site went on to say that because of the city’s efforts, Birmingham is now considered among the top 20 walkable towns in the U.S.
Planning Director Jana Ecker said all of the city’s planning practices work towards walkability, and creating a lively and diverse atmosphere that will encourage visitors and residents alike to spend time downtown. “We have several master plans across the city — the downtown, Rail District, Triangle District — that all require a mix of uses to create a live, work and play environment. All of these plans are also form-based, in that there are regulations built in that mandate the form and location of buildings to create pedestrian-friendly, walkable streetscapes, such as requiring buildings to be built up to the frontage lines, hiding parking in the rear, requiring pedestrian-scaled architectural details along street facades, creating public gathering spaces, and enhancing sidewalk activity through outdoor dining, street furniture and special events,” she said. CNNMoney.com also noted the wide mix of shops, restaurants and entertainment available in the city’s downtown, as well as the abundant opportunities for recreation within the city’s 220 acres of parks, two community golf courses, several tennis courts and trails along the Rouge River. In some categories, Markus said, he is considered a senior now. He sees the city as a great place to retire. “It’s a wonderful town. It’s a civically engaged community, and people are passionate about their town,” he said. “We have had people come here specifically to retire — I know that, because I know some of them — but I think what’s equally impressive is people don’t leave to retire,” he said. Mayor Stuart Sherman said it seems that the rest of the country is just now noticing that Birmingham is a great place to live and recreate. “We have worked very hard to make Birmingham a premier community, and our work is paying off. This just confirms what the residents and visitors to Birmingham already know — with our walkable neighborhoods and downtown and our improved parks, Birmingham offers many opportunities for people to be active and enjoy the atmosphere,” he said. The area's leading creators, catalysts, entrepreneurs, artists, technologists, designers, scientists, thinkers and doers will gather on Wednesday, October 21st to share what they are most passionate about — positive ideas for the world from Detroit. This year, TED expands beyond its annual conference by seeding smaller, independent events throughout the nation, called TEDx. The first TEDxDetroit will emulate the spirit and ideals of the TED Conference. TEDxDetroit will be held at Lawrence Tech's Science Building Auditorium in Southfield, Michigan, from 8:30AM to 6:00PM, Oct 21. Due to an outstanding response, the conference is full, but several surrounding events have been opened to the public in an effort to bring the entire community into the excitement. This is an informal gathering for attendees and friends to meet, connect and enjoy a cocktail in a relaxed setting the night before the event. The pre-party tweetup will be co-hosted by i-detroit.com and take place at a popular nightspot Bar Louie in Novi (near the junction of I-275, I-96 & I-696). This is a free event and open to the public. The moment you've been waiting for. Doors open at 8:30am. The program starts promptly at 8:48am. The event is sold out. If you have been notified that your application for attending has been accepted, please arrive early to claim your seat. Please bring $20 cash or a check payable to "Public Art Workz" for admission. We'll be breaking for lunch just after 11am. Our community partners LA2M and Motor City Connect are hosting a TEDxDetroit networking lunch. We encourage you to click the link below to register for lunch ASAP. This event will be open to non attendees as well and will sell out. Cost $20 in advance. Reflect and connect with speakers, attendees and community leaders at this informal gathering. Light hors d'oeuvres will be available. The venue also offers a full cash bar and a dinner menu which features items such as their famous gumbo. This is a free event (pay for your own dinner and drinks) and open to the public. Home Box Office filmmakers for the Jack Kevorkian biopic "You Don't Know Jack" will be in town this week to film scenes for the movie already in production in New York City. Both interior and exterior shots are planned at the Oakland Circuit courthouse off Telegraph Road in Pontiac, where the former pathologist, now 81 years old, was a frequent visitor in the years before being sentenced to prison in 1999 for second-degree murder in one of 130 deaths he claims to have assisted over a decade. Actors Al Pacino, John Goodman and Susan Sarandon are just a few of the film's stars expected to be in town, according to Kevorkian attorney and friend Mayer Morganroth. Goodman is to portray Kevorkian's friend, Neal Nicol, and Sarandon will take the role of Janet Good, a right-to-die advocate and former head of the Michigan Hemlock Society, who befriended Kevorkian and also died with his help. Pacino has the lead role of Kevorkian, but don't look for him and the man who became known as "Dr. Death" getting together during the shoot, Morganroth said. "Pacino doesn't even want to meet Jack until the filming is done on this project," said Morganroth, a consultant on the film. Like several other principals close to the Kevorkian story, he will be interviewed for a behind-the-scenes "making of" the film expected to be released sometime next year. Courthouse filming is expected to be shot Thursday and Friday. And for some who were around when Kevorkian made headlines here in the 1990s, the scene may be like travelling back in time. In some of his last court appearances, the outspoken and always irascible Kevorkian strolled past sign-toting critics and supporters dressed in colonial-style garb, wig and even slipped his arms through a set of fake wooden stocks, a common punishment for running afoul of the law in the 1700s. It is expected Pacino may don some of the same type of paraphernalia for the film, directed by Barry Levinson, whose resume includes the Academy Award-winning "Rain Man." Filming is also expected to take place at other Oakland County locations, including near places where Kevorkian lived and created his self-proclaimed "Mercitron" (assisted suicide machine) and where some of the assisted suicides occurred. Kevorkian served eight years of a 10-to-25-year sentence and was paroled in June 2007 for good behavior. Jessica Cooper -- the judge who sentenced him with a terse "no one is above the law" and "consider yourself stopped" -- became the county's prosecutor earlier this year. "I've had a conversation with the film's screenwriter, as has (assistant prosecuting attorney) John Skrzynski, who handled the case," said Cooper. "We've both been given the impression it will be balanced, and I guess we will just have to see. I can't think of anyone better than Pacino playing him." Sporting News Magazine just released its annual "Best Sport City" survey and Detroit landed on the #10 spot. I personally think we are number one, but hey making the top ten is still pretty good. Also, a word of caution to Wings fans who are still a bit sore from this year's Stanley Cup outcome: you may want to skip over the #1 pick. 17. Raleigh + Durham + Chapel Hill, N.C. Ask metro Detroiters to describe Vietnamese food and you may get a shrug of the shoulder. It’s hard to place the blame - Vietnamese restaurants aren’t very prevalent in the metro area and most are accustomed to dining amongst the other Asian influences. Clawson’s Đà Nẵng restaurant is attempting to change that. Open since March 6, 2009 and located at the corner of 14 Mile and Main Street (Livernois), Đà Nẵng is named after one of the biggest port cities in Vietnam. Owners Kim Dao Waldis and her sister Lan Dao have been busy educating customers on the balance and fresh flavors that Vietnamese food has to offer. It’s certainly a unique style of cuisine boasting delicateness, subtlety and freshness while still finding influence from Chinese and French palettes. You won’t find an abundance of fried foods or the typical soy, or sweet and sour sauces. What you will experience is food that is both satisfying and delicious (without being heavy and tiring) in a pleasant and tranquil atmosphere. Especially popular in Vietnamese fare, the Phở soup varieties are fantastic pick-me-uppers complete with a variety of ingredients and flavors. Try the Phở Tái, a thick rice noodle soup topped with thinly sliced top round beef served with fresh vegetables. Or the Phở Tái Nạm, a similar soup with beef flanks. The Phở Tái Bò Viên soup combines the round beef with house-made beef meatballs. For vegetarians, the Phở Chay is a great choice mixing a thick rice noodle vegetarian soup with tofu and fresh vegetables. New batches of the soup are made daily and are prepared with fresh basil, bean sprouts, fresh lime juice. They also come with a choice of additional sauces. Try a grilled steak salad or enjoy a somewhat traditional sweet and sour chicken (traditional except that the sauce on this entrée is extremely light and full of flavors). Other staples include the Gỏi Cuốn (a fresh spring roll of shrimp, steamed pork, vermicelli and fresh vegetables rolled in rice paper served with house hoisin sauce and topped with peanuts), a variety of satays (chicken, pork, beef or shrimp) and a variety of noodle and rice dishes. Quality is paramount at Đà Nẵng with particular emphasis being placed on the proper refining of the fish sauce exhibiting a clear appearance (versus a cloudy, unrefined sauce, causing its flavor to improperly linger). Equally important is the lack of the sodium salt MSG (Monosodium glutamate) in their dishes thus helping to preserve the foods freshness. Don’t let the fact that Vietnamese kitchens are not the typical Asian dining destinations (at least in the metro area) fool you – one trip to Đà Nẵng and you’re bound to make it a regular stop to satisfy that need for freshness and hunger.